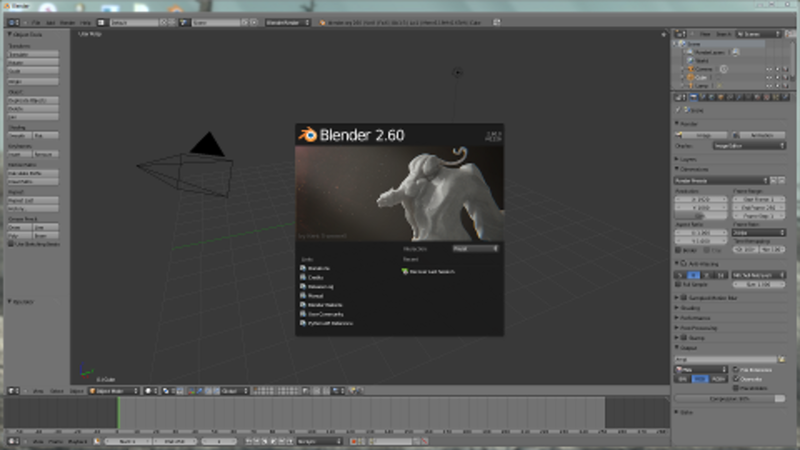 This is the first in a series of tutorials about using Blender 2.60. In this mini-tutorial, I will show you how to transform a box by moving it, rotating it, and scaling it. Future tutorials will show you how to edit these objects to create your own, unique 3d art. If you want to find out more about the history of Blender and what it's capable of, check out my other hub: Blender Free Open Source 3D Modeling and Animation Software. Blender's workspace. 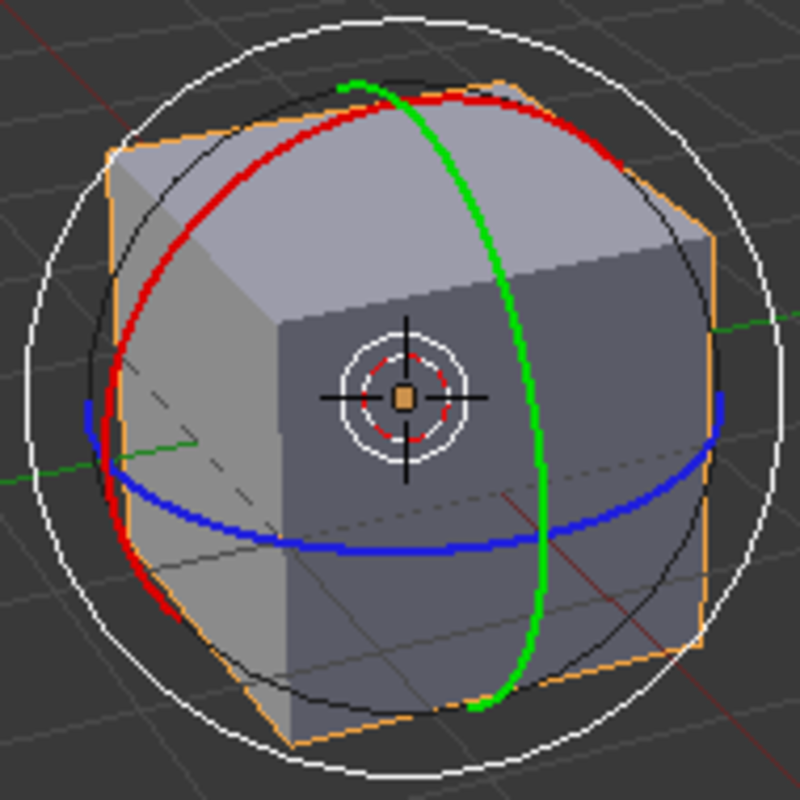 The viewport is in the middle. In this tutorial, I'm only going to talk about the 3D viewport and one widget on the toolbar below this viewport. The viewport is the large area in the middle of the screen where all the magic happens. It says 'User Persp' in the top left corner. The camera has been selected. 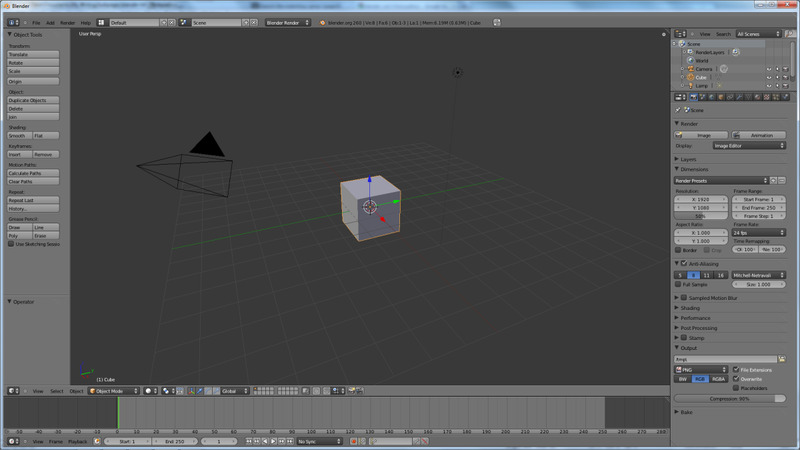 By default, the 3D viewport comes loaded with three objects: a simple cube, a light source, and a camera. 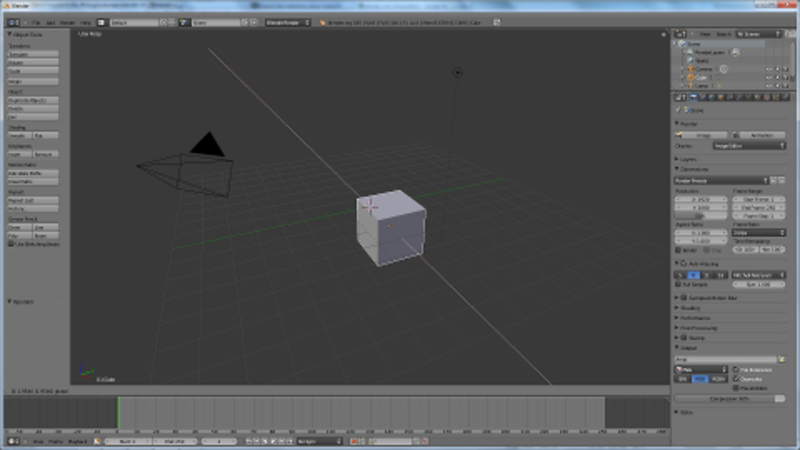 The cube is the active object, which you can tell by its orange highlight. It's sitting on a white two-dimensional grid that has red and green lines to show you where the X and Y axes are. The camera is the pyramid wireframe with a black triangle over it showing which way is up. (The square 'base' of the pyramid is the front, or lens.) The light source is a small black sphere with dotted circles around it connected to the grid by a thin line and looks a bit like a black sun on the end of a stick. 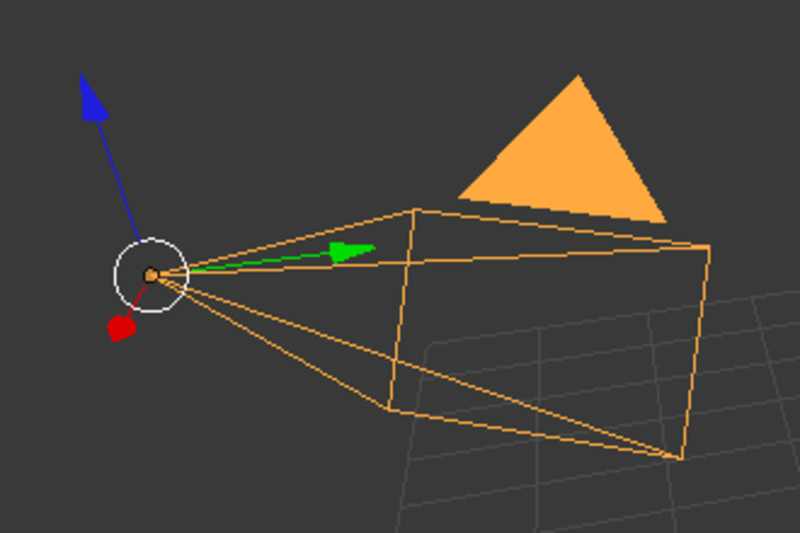 You select objects in Blender by right-clicking them. Try selecting the camera and the lamp to see how it works. 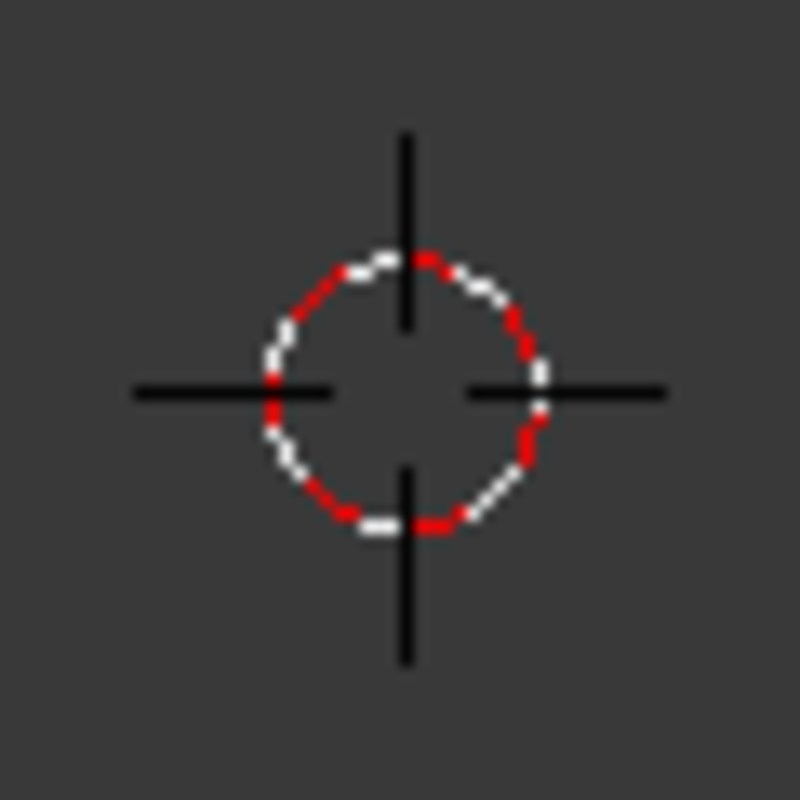 If you left click anywhere in the viewport, you'll notice that the little red and white bulls-eye follows you around. This is the 3D cursor, which works exactly the same as a 2D cursor in a text document except in three dimensions. I'll more about the 3D cursor in later lessons. For this lesson, it doesn't matter where your cursor is. 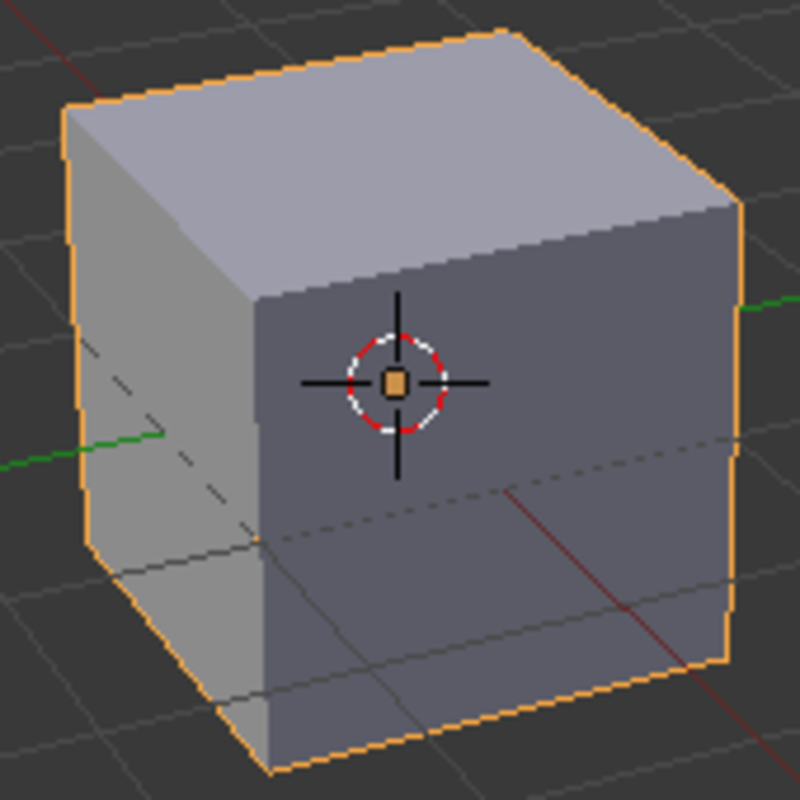 The 3D Manipulator is visible inside the cube. The 3D Manipulator toolbar widget with Translation mode active. 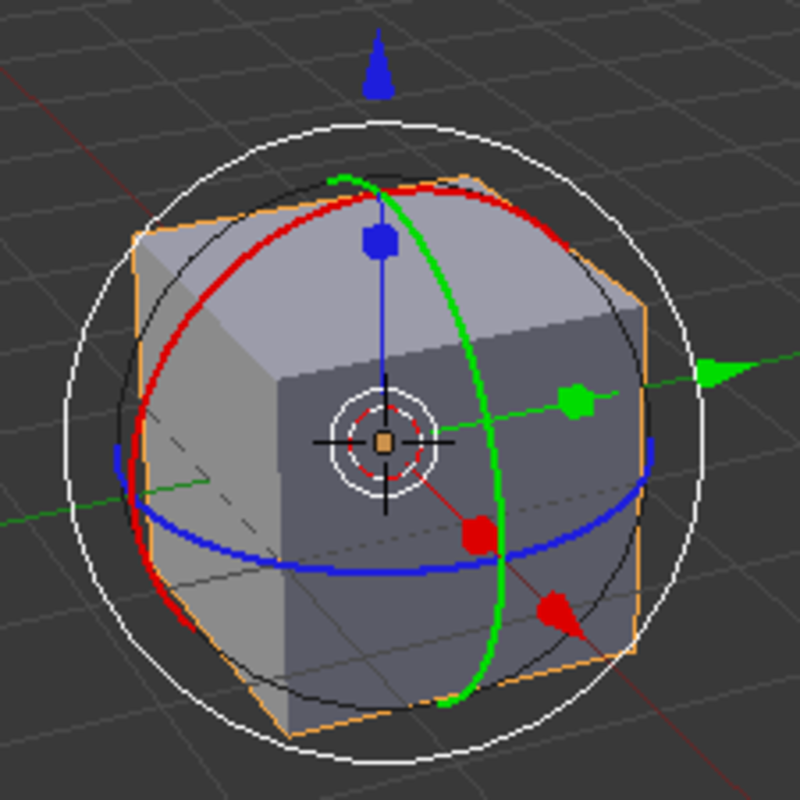 In the middle of the cube is the 3D manipulator widget; it looks like a group of red, green, and blue colored conic arrows radiating at right angles from a white central point with a white ring around it. The 3D manipulator is used to transform, or move, rotate, and scale, objects. If you select the other objects, you'll notice that it follows you around, allowing you to move anything in the scene. The colors have a fairly standard definition across 3D applications: red is the X axis, green the Y axis, and Z the blue axis. Different applications orient these axes differently, but the meanings remain the same. 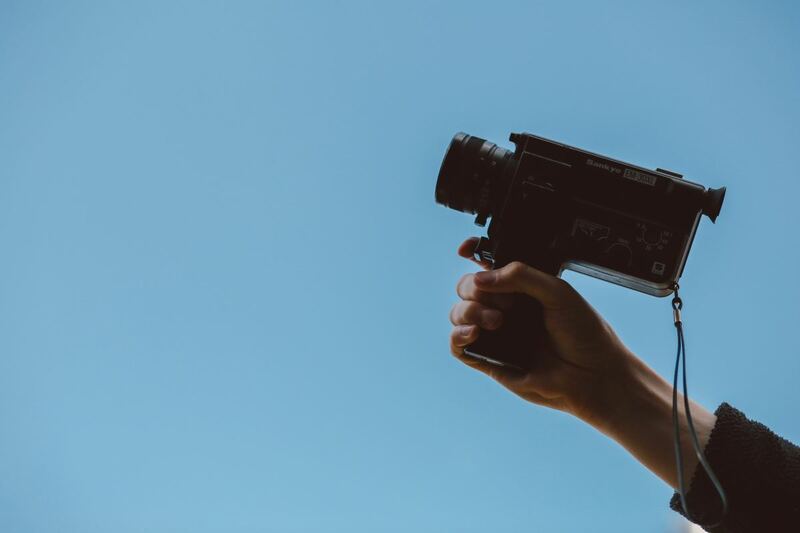 You may remember the X and Y axes from high school plotting points on a graph; 3D applications use those axes plus a third axis, the Z axis, which represents the third dimension and allows us to represent 3D objects using the 2-dimensional surface of the screen. You can see the current orientation of the screen in the bottom left corner of the workspace as a miniature version of the three axes. The bottom left corner will also show you the name of the currently selected object. Select the cube by right-clicking it if it's not already selected. Left-click one of the arrows on the 3D manipulator and hold the button down while you drag on the arrow. The cube will follow you along the axis as you move your mouse. 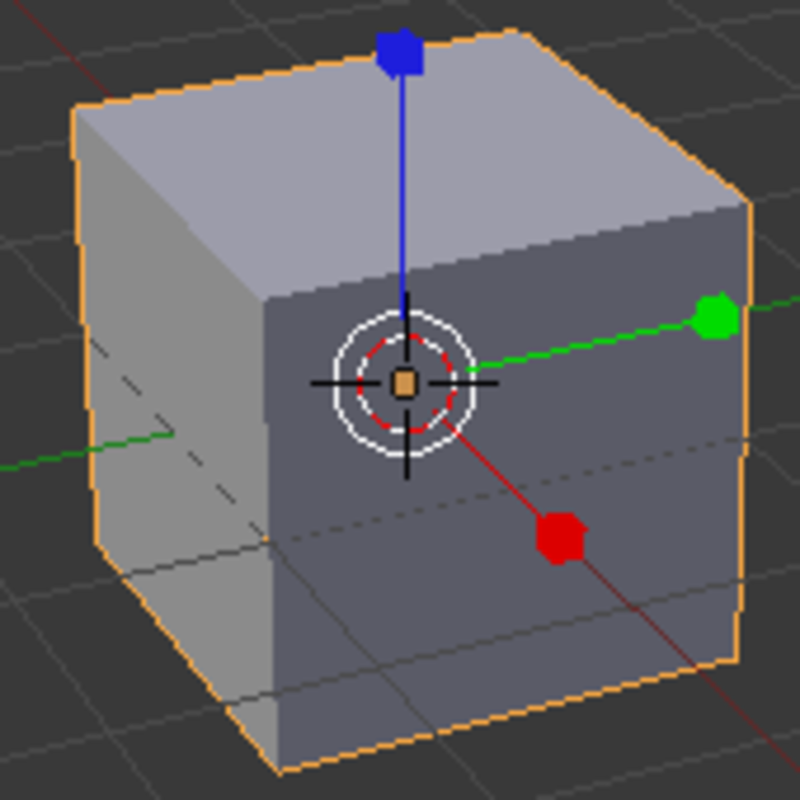 If you let go of the left mouse button, you will release the 3D manipulator and the cube stops wherever it happens to be. The technical term for moving an object in a 3D application is translating. If you selected the red arrow, you were translating the cube along the X axis. You can grab the white circle in the center to move the cube freely in any direction. You can press Ctrl+Z to undo your translation and return the cube to the center of the screen. Translating (moving) an object along the X axis. Activating Rotate mode in the 3D Manipulator toolbar. Now we're going to rotate the cube. Make sure the cube is selected by right-clicking it to highlight it in orange. Next, select the curved icon in the manipulator widget to switch to rotation mode. The 3D manipulator widget is located on the tool bar below the 3D viewport. Once you have selected the rotation icon, the cube will be surrounded by red, green, and blue circles and a larger white circle. Grab one of the circles by left-clicking on it and rotate the cube by dragging the mouse. The rotation will be constrained to whatever axis you manipulate, so if you grab the green circle, all of the rotations will be constrained to the Y axis. If you grab the white circle, the rotations will be constrained to an angle perpendicular to the viewport, or current viewing angle. In other words: it will rotate around the center of the screen. Press Ctrl+Z until you get the cube back to its original position. Activating Scale mode in the 3D Manipulator toolbar. 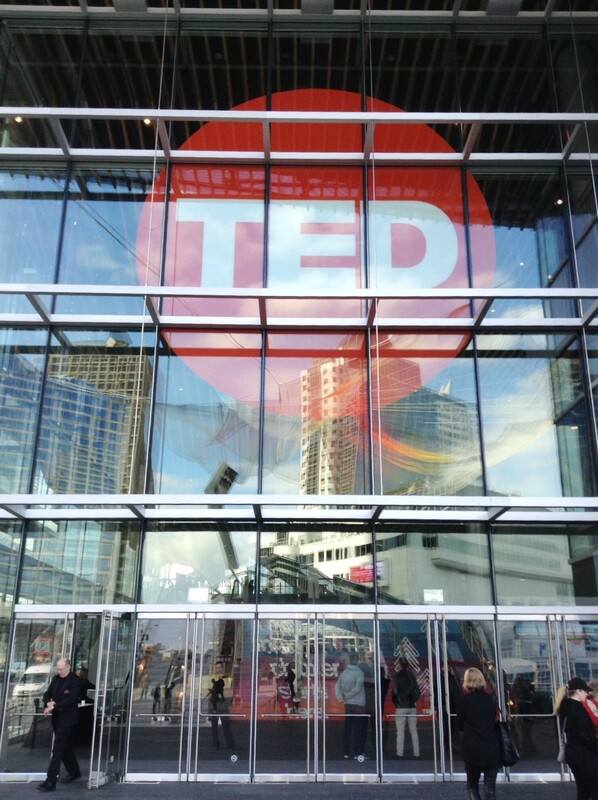 Scaling is a fancy term for changing the size of an object. If you select the icon of a square with a line coming out of it in the manipulator widget, you can switch to scale mode. The manipulator will now change into three lines with cubes at the end of them. To scale an object along an axis, grab the arm of the manipulator by pressing the left mouse button and dragging the mouse. 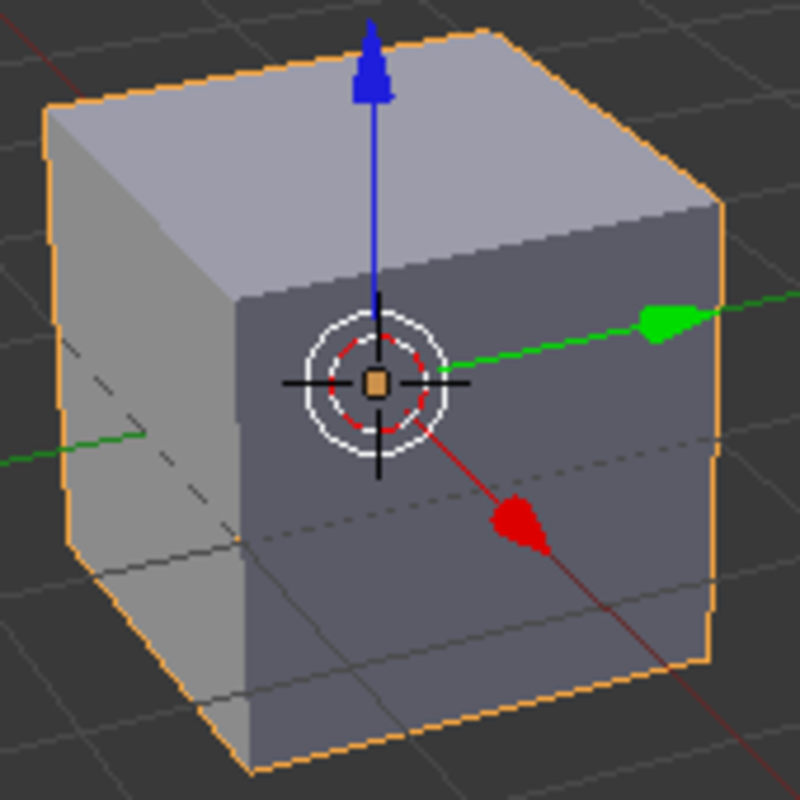 If you grab the blue cube and drag you will be scaling the box along the Z axis. You can scale the cube in all three directions at once by grabbing the white circle in the center of the manipulator. All three operations: translating, rotating, and scaling are known collectively as transformations. Try selecting the camera and the lamp and moving them around as well. The 3D Manipulator with all three transformation modes active. All transformation modes selected on the toolbar. You can combine manipulators into a single widget by holding down the Shift key as you select the manipulator icons with the left mouse button. This can be handy if you're doing a lot of free-form transformations on an object. To unselect a selected transformation mode, just select it again while holding down the Shift key. The 3D Manipulator has been turned off. The 'bulls-eye' in the center is the 3D Cursor. You don't need to use the manipulator menu on the tool bar to switch between translation, rotation, and scaling. Blender has hot keys for almost everything; in fact, it has been designed to take advantage of hot keys extensively, and you will find your work flow improved dramatically by using them. You will probably find, as your skills improve, that you often want to get rid of the manipulator entirely, which you can do by deselecting the icon on the menu bar or by pressing Ctrl+Space. To switch between modes without using the tool bar menu, use these keys: G for 'grab' to switch to translation mode to move objects; R for 'rotate' to rotate objects; and 'S' for 'scale' to scale objects. These hot keys are easy to remember (the only odd one is using G to grab instead of T to translate, but grab is easier to remember anyway) and can be combined (or 'chained') with other keys to perform complex tasks quickly without having to resort to lengthy sessions of menu-surfing. There are plenty of other ways to use the hot keys and thousands of operations you can perform in Blender, but I think that's more than enough for a short tutorial like this. Of course this is only the tip of the iceberg! Blender can do a lot more than move cubes around a screen! In the next tutorial, I will show you how to move around in the 3D viewport to view objects from different perspectives.